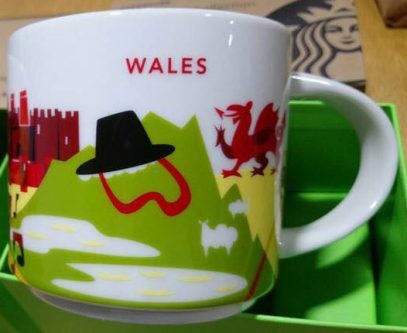 The mug is designed having in mind the Flag of Wales, which incorporates the red dragon along with the Tudor colors of green and white. – green hills or mountains – probably referring to Snowdonia – mountainous region and a national park in northwestern Wales. On exceptionally clear days, Ireland, Scotland, England and the Isle of Man are all visible from Snowdon mountain. – Welsh hat – is a part of Welsh national costume for women. Nowadays, it is only worn on holidays though. – Conwy Castle – built by Edward I, on the north coast of Wales, between 1283 and 1289. – Llanthony Priory – remaining of the priory which dates back to around the year 1100. – Daffodil – the national flower of Wales, and is worn on March 1, St David’s Day. It is also called “Peter’s leek” in Welsh. – Tuxedo – I tend to believe this is related to Sir Thomas Jones Woodward, a.k.a Tom Jones, famous Welsh singer. He’s one of the most popular vocalists with over 100 million records sold.